'Your Future. Our Purpose.' 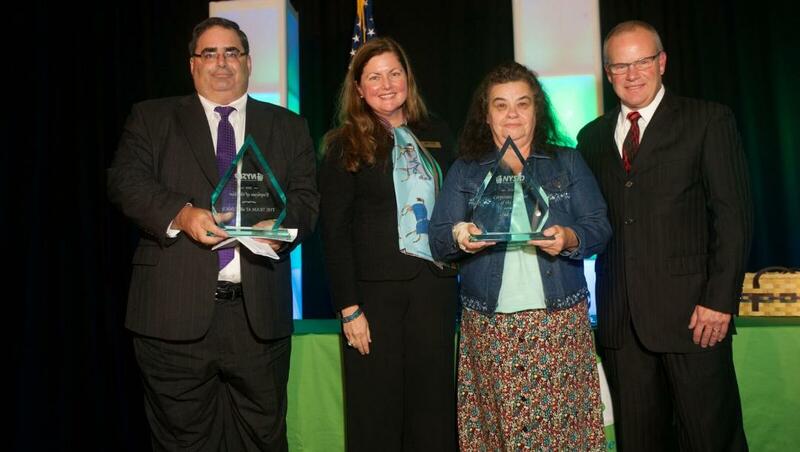 Annual Meeting Celebrates Workers With Disabilities for Excellence in Job Performance - New York State Industries for the Disabled, Inc. In an extraordinary event marked by several "firsts", NYSID honored New Yorkers with disabilities, and organizations that support employment opportunities for these individuals, during our Annual Meeting on October 11. View the Annual Meeting Awards video playlist. This was NYSID's first Annual Meeting at Albany Capital Center, our first during National Disability Employment Awareness Month #NDEAM, and our first on the eve of The Arc New York's Board of Governors annual conference. The event also was the first for Maureen O'Brien as NYSID president & CEO. She is NYSID's first female CEO and fifth CEO overall in NYSID's history, replacing Ron Romano, who recently retired after 21 years of service with the organization. Kumi Tucker, weekend anchor from WNYT NewsChannel 13, once again served as emcee, delighting the crowd with her wit and demonstrating her passion for NYSID's mission. The Annual Meeting is NYSID's signature event, bringing together NYSID's membership, corporate partners, legislative and government guests, and other supporters for the 2018 business highlights and honoree awards in recognition of Preferred Source employment excellence. The theme was "Your Future. Our Purpose." October is also NDEAM, and in keeping with the U.S. Department of Labor’s commitment to ensuring a workforce for individuals of all abilities, "America's Workforce: Empowering All" is this year's official NDEAM theme. NYSID's annual Joslin Awards Program celebrates those who have overcome individual challenges to experience meaningful employment on NYSID Preferred Source contracts. In its 15th year, NYSID's Joslin Awards Program has recognized 770 Outstanding Performers, and awarded 19 of those individuals with the final William B. Joslin Outstanding Performance Award. During the Annual Meeting, a tribute video honoring Ron Romano was shown to an appreciative audience. Two employees who have been with NYSID for 20 years also were recognized: Frank Heuer, manager of information technology operations; and Pat Joseph, receptionist in NYSID's New York City office. We invite you to follow NYSID on our social media in the coming days and weeks for more photos and videos from the Annual Meeting. Thanks to everyone who participated in our signature event at Albany Capital Center in support of our theme, “Your Mission. Our Purpose,” and our shared mission, "Advancing employment and other opportunities for individuals with disabilities."